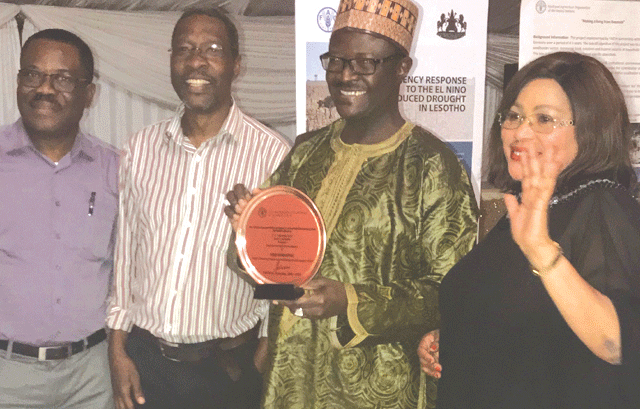 The local country office of the Food and Agriculture Organisation of the United Nations (FAO) won the coveted Poster Presentation Award last Friday. This was at a gala dinner held in the Zimbabwean capital of Harare, FAO Eswatini got third prize for presenting a poster with clear results and impact of FAO’s interventions on an agroforestry project. Eswatini was up against 15 countries from the Southern Africa region with Lesotho receiving the first prize while Zimbabwe got the second position. FAO Sub-regional Office for Southern Africa (SFS) hosted the awards for the first time this year to encourage country offices to report results and impact of FAO interventions. The awards followed a successful 12th FAO SFS senior management meeting under the theme: Enhancing Results and Partnerships to End Hunger in Africa. “As FAO Eswatini, we are excited to win this award because it speaks to the results that our farmers are producing based on the technical support from FAO. This award is about recognising projects that have brought positive change to our farmers on the ground as we move towards ending hunger in Africa by 2030.” Assistant FAO Representative to Eswatini Khanyisile Mabuza said. Mabuza thanked FAO donor partners and the government for the continued support in working with farmers to produce best results towards achieving Goal number two of the United Nations Sustainable Development Goals – Zero Hunger. The winning poster featured agroforestry farmer, Zuka Bhembe, of Elwandle just outside Manzini who, through support from FAO, has moved from subsistence to commercial farming. Bhembe was a thriving green mealies farmer for over 20 years until a chronic drought that started in the 1990s hit him reducing his production in his two-hectare field by half. As a result, he was unable to service his loan with the bank, pay school fees for his children and provide adequate food and nutrition for his family. In 2010, the ministry of agriculture selected him to be among farmers to benefit from a FAO climate change adaptation project funded by the European Union to the tune of €14.3 million. Through the Swaziland Agriculture Development Programme (SADP), FAO trained the farmers on Climate-Smart Agriculture and agroforestry techniques. The farmers were beneficiaries of seedlings for legumes and fruit trees to help them diversify their crops, build resilience, generate income and improve food and nutrition security. Apart from the training, FAO supported Bhembe with five seedlings each of the following fruit trees: pawpaw, oranges, leeches, banana and mangoes as well as a diesel water pump. n Built a modern two-bedroom house with a loan he finished paying within a year. n Finished paying school fees up to tertiary level for all his eight children. n Students and farmers from all over the country visit his field to learn about agroforestry.